Pitt Athletic Director Heather Lyke announced in January that Pitt will be implementing its own Hall of Fame, with the inaugural class to be inducted Sept. 7. We’ll have to wait a few months to find out who will make the first Hall of Fame class — in the meantime, The Pitt News sports staff has some suggestions of who should be inducted in September. While H.B. Blades doesn’t have the fame of many Pitt football legends, his dominant career as middle linebacker leaves him worthy of entrance into Pitt Football’s inaugural Hall of Fame class. Blades played for the Panthers from 2003 to 2006 but was never the biggest star on the field. Larry Fitzgerald took the spotlight in his last season as a Panther in 2003. In 2004, future star Tyler Palko took over as quarterback, while freshman phenom Darrelle Revis entered the fold at cornerback — becoming the household name of the Panther defense. Blades is third all-time in Panther history with 433 tackles while only starting for his last three seasons. In each of those three years, he earned first team All-Big East honors. He was even the first Panther to win the Big East Defensive Player of the Year Award after his senior season — beating out teammate Darrelle Revis before they both headed to the NFL that April. Blades didn’t have the physical gifts to excel at the next level during his four-year NFL career, but this award isn’t about the NFL — it’s about a historic career as a Panther. And the sustained dominance of H.B. Blades makes him one of the best, if not the best, Panthers of all time. He also won the U.S. Olympic trials with a time of 1:49.9, one-tenth of a second from the world record. Woodruff is one of only two Pitt alumni with a gold medal, and his Olympic gold medal is currently displayed in the Hillman Library. His athletic career was cut short by World War II, but he still managed a decorated career. He won the American Athletic Union title in the 800-meter in 1937 and the Intercollegiate Association of Amateur Athletes of America titles from 1937 to 1939 in the 440-yard (400-meter) and the 880-yard (800-meter). Combine his accomplishments on the Olympic stage with his collegiate titles, and he very clearly deserves to be in the inaugural class for the Pitt Athletic Hall of Fame. Tony Dorsett may be the most obvious choice for the Pitt Athletic Hall of Fame, as he arguably accomplished more than any other Panther athlete in school history. Dorsett played running back for the Panthers from 1973 to 1976. During that time, he not only became the greatest Pitt running back of all time, but also one of the premiere backs in college football history. Dorsett was an All-American in each of his four seasons, and he became the team’s all-time leader in rushing yards in just his sophomore season. He eventually built that yardage total up to 6,082 by the end of his college career— making him college football’s all-time leading rusher at that point. 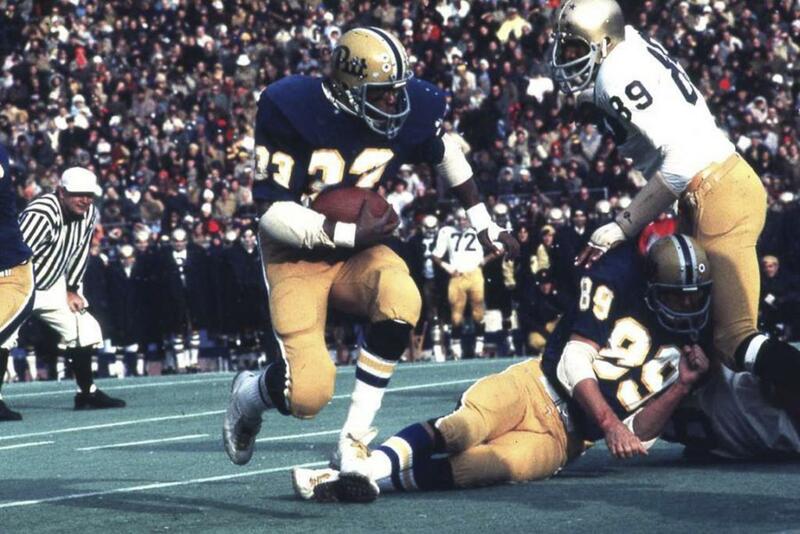 In Dorsett’s senior year of 1976, he contributed what is likely the most successful season in Panther athletics history, rushing for 2,150 yards — a Pitt single-season record — en route to a Heisman Trophy award. Dorsett is still the only Panther ever awarded this honor. Dorsett remains Pitt’s leading rusher by a large margin, 2,349 yards ahead of second-place James Conner. His perch atop college football’s leading rushers has since been passed, but he still sits at fourth place all time. Dorsett had a successful NFL career, but will always be remembered as one of the greatest athletes to ever grace the blue and gold. Some of Pitt’s most notable athletes have played one of two sports: football or basketball. For the perfect nonrevenue candidate, look no further than former Pitt wrestler and coach Rande Stottlemyer. Stottlemyer’s Pitt wrestling career began in the 1974. By the time he finished in 1978, he was a three-time All-American and team captain, posting a career record of 68-16-2. Following his graduation, Stottlemyer was brought on as an assistant coach for a single season before taking over head coaching responsibilities in 1979. He went on to serve as head coach of the Panthers for the next 34 seasons. In 2013, Stottlemyer retired as the winningest wrestling coach in Pitt history with an overall record of 304-231-12. He coached 33 All-Americans and three national champions in addition to 53 Eastern Wrestling League individual champs. Stottlemyer died Jan. 28 of this year at the age of 62. He will be remembered fondly by Pitt fans as one of the most successful and influential athletes and coaches in Pitt history. Although he stood at only 5-foot-10, Levance Fields was one of the greatest point guards in Pitt men’s basketball history. Despite not playing much in his first year, Fields became starting point guard in his sophomore season and began to make his mark. He was a fantastic ball-handler and passer with the third most assists in Pitt history with 645. He also set the Panthers’ single-season assist record with 270. Throughout his career, Fields was also known as a clutch player, coming up huge in two big games. He hit a game-winning 3-pointer against Duke in Madison Square Garden in 2007. Then, in the 2009 NCAA tournament Sweet 16 against Xavier, he hit a big 3-pointer and stole the ball for a layup to lead Pitt to its first Elite Eight. Fields played during some of the best years of Pitt basketball history — from 2005 to 2009. Fields starred on the 2008-09 Panthers team that went on to earn the school’s first No. 1 ranking both nationally and in the NCAA tournament. His leadership and grit helped give the Panthers some of the best basketball they’ve ever seen. Fields’ contributions to the Pitt basketball program will never be forgotten, and should earn him a spot in the Pitt Hall of Fame.